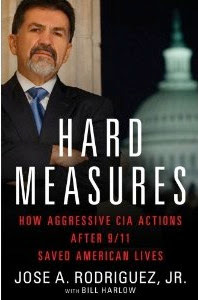 Having written an article last year called "Burn after Viewing" that examined the CIA's destruction of the interrogation tapes from the perspective of the federal records laws, I was disappointed to read initial suggestions by WashPo and AP that former CIA officer Jose Rodriguez's new book "Hard Measures" gave very few new details about the destruction of the CIA tapes. Having now read it, Rodriguez's account, in my view, actually provides crucial new information, further confirms facts that have been largely ignored, and highlights troubling - and still unresolved - questions about the CIA's treatment of the tapes. The publication of the book has also unfortunately resurrected a tired debate between those who argue Rodriguez is a clearly a criminal for ordering the tape destruction (see, e.g., Scott Horton and, predictably, Glenn Greenwald) and those who think Rodriguez is a courageous hero for doing so (see, e.g., Rodriguez and his lawyer). The book illustrates that neither narrative is accurate. The most significant problem with the fixation on the lack of criminal charges against Rodriguez is that - perhaps counter-intuitively - it underestimates the significance of the issue of the destroyed tapes, which is not confined to 92 videos and one criminal act. The real issue is systemic and institutional and relates to the CIA's questionable and ongoing legal interpretations. While Rodriguez's focus on the CIA's legal advice may be self-serving, that doesn't make it inaccurate. Corroboration is provided by a long string of public statements and court filings in which CIA attorneys took sometimes breathtakingly aggressive positions to justify the conclusions on which Rodriguez relied. A brief montage . . . According to the CIA, the tapes: "were not federal records as defined by the Federal Records Act" which meant the most basic preservation requirements of the federal records laws did not apply; were "not responsive" to any of the ACLU's FOIA requests; were not covered by any of the 9/11 Commission's requests; were "no longer at issue" in the Moussaoui case; were "irrelevant" to Abu Zubaydah's foreseeable habeas case, etc., etc., etc. In short, in the CIA's view, the destruction was completely "in line with the law." Of course, Rodriguez was nevertheless ordered not to destroy the tapes. Yet based on the CIA's legal advice, Rodriguez's act was precisely (and solely) what the CIA reprimanded him for in Dec. 2011 -- an act of administrative insubordination. Despite widespread public incredulity, DOJ prosecutor John Durham's inability to prove criminal intent is completely unsurprising. Following the disclosure of the destruction, however, courts have had little difficulty identifying legal obligations to retain the tapes that CIA lawyers were repeatedly unable, or unwilling, to recognize (see, e.g., Judge Roberts finding that a GTMO detainee made a "sufficient showing" that the tapes were subject to a 2005 preservation order or Judge Hellerstein holding that the tapes were records subject to the ACLU's FOIA requests). Rodriguez also provides a graphic, if unintentional, illustration of why the decision of CIA attorneys to deny the tapes even the basic status of a federal record was so consequential and why the federal records laws are designed to take crucial decisions about preserving government records out of the interested hands of agency officers. As compelling as his justifications for destroying the tapes may appear to him, Rodriguez's account shows his decision to be transparently shortsighted and unsupported. Rodriguez argues, for example, that destroying the tapes was necessary to protect the CIA officers depicted, while apparently failing to consider, among other things, that the destruction could have just as easily harmed those same officers by denying them evidence of good faith attempts to conduct the interrogations in line with DOJ guidance. More broadly, Rodriguez's disgust at criticisms focused on CIA interrogators comes without any apparent self-awareness that his tape destruction made those criticisms worse by predictably bringing heightened scrutiny to the interrogation program and foreseeably giving the impression that the tapes were inculpatory rather than exculpatory. Rodriguez's surprise at the magnitude of the backlash over the destruction also makes little sense to the reader after he catalogs all of the many "cowardly" senior government officials who told him it was a bad idea. Finally, the book itself provides details that undermine Rodriguez's fears about the tapes falling into the wrong hands. Several passages juxtapose and highlight crucial changes in the custody and protection of the tapes. In one passage, for example, Rodriguez, concerned that the location of the facility where the tapes were made, reportedly in Thailand, "was about to leak," issued "an order that the facility be closed in ninety-six hours." CIA officers quickly began destroying anything not needed "so as to leave no reminders of what had taken place there." This cable may well connect the story to a second passage in the book almost 80 pages later, in which Rodriguez uses a full paragraph to describe the industrial-strength shredding machine "in use at U.S. government facilities" whose "five spinning and two stationary steel blades" reduced the tapes (which Rodriguez calls "[o]ur problem") into "confetti" three years later. The contrast between the bonfire and the industrial shredder highlights the omitted fact that, at the time of their destruction in Nov. 2005, the tapes were no longer in a secret, unsecure black site facility (where the argument for hasty destruction in an emergency evacuation is more compelling), but were instead, reportedly, held in a safe in the office of the CIA station chief within the U.S. Embassy compound in Bangkok, Thailand, whose gates are guarded by U.S. Marines (and whose equipment likely includes a sophisticated shredder). Rodriguez even notes that a suggestion that the tapes be transferred back to the U.S. for greater protection "[f]ortunately" was "dropped" because, in Rodriguez's personal opinion, it "would only ensure that the tapes would be copied, passed around, widely discussed, and most likely result in a decision on someone's part to officially release or to leak them." The accuracy of his personal pessimism, which is itself a devastating criticism of the CIA's ability to preserve secrets, is undermined by the subsequent treatment of the two most comparable sets of materials: DoD photos of detainee abuse whose court-ordered disclosure was stopped when President Obama signed the "Protected National Security Documents Act" and the pictures of dead Osama bin Laden, which also remain undisclosed. Had CIA attorneys simply given the tapes the small dignity of being records, however, all of the discussions about whether destroying them was politically palatable or whether they were relevant to various legal proceedings would have been moot, Rodriguez would not have been advised that there was no legal obligation to retain them, and the decision to destroy them would not have been left to Rodriguez's "courageous" decision-making. Rodriguez's account also sheds new light on a crucial lynchpin in the ACLU FOIA case by identifing the CIA attorney from the Office of General Counsel (OGC) who viewed the videotapes in Nov. 2002 as "one of the assistant general counsels" whom Rodriguez calls "a very senior Agency officer." The attorney was later interviewed by the CIA Office of Inspector General (OIG) about that review. Rodriguez's small, but important details corroborate earlier reporting by the AP and WashPo that the OGC attorney was John L. McPherson, who based on unrelated court filings, was an Assistant General Counsel as of 2001 and later became an Associate General Counsel. Why is this significant? Hellerstein found the tapes subject to FOIA because they were "identified and produced to" the CIA's OIG "as part of its investigation into allegations" of unauthorized interrogations and human rights violations. Yet Hellerstein stopped short of finding the CIA in contempt in part because "the individuals responsible for processing and responding to plaintiffs' FOIA requests may not have been aware of the videotapes' existence before they were destroyed." Remarkably, however, the crucial FOIA response from the CIA regarding the records of the OIG in April 2005 (ergo, 7 months prior to the destruction of the tapes) was written by none other than John L. McPherson. That is, the most important FOIA response in the case was written by the very CIA attorney who, if reporting that Rodriguez's book tends to support is true, arguably knew more about the tapes than anyone else. See for yourself here. What did we learn, Palmer? Finally, Rodriguez's documentation of the extensive legal reviews regarding the tapes is relevant to the CIA's troubling and ongoing interpretations of its recordkeeping responsibilities. These were highlighted by a declaration submitted late last year by current CIA General Counsel Stephen Preston to Judge Hellerstein in a further attempt to avoid contempt sanctions in the ACLU FOIA case. Preston asserted that the CIA was, in fact, adopting "remedial measures" in order to address any "systemic issues" raised by the destruction of the tapes. The summaries the CIA later provided of its "new" policies, however, fall well short of the mark. The central "new" policy provides simply that if the OGC "receives a proposal from a CIA component" to "destroy documents outside the existing process for routine management of CIA materials under applicable law or Agency regulations" (my emphasis) and those documents "may relate to any pending or anticipated" investigation or litigation, the OGC will advise in writing to preserve the documents pending an OGC review, consultation with other agencies, and a final decision by the GC. Judge Hellerstein somehow, inexplicably, believed that this policy would "prevent another episode like the videotapes' destruction." While I hesitate to say this and hope that I am wrong, I find it hard to avoid concluding that Hellerstein misinterpreted both the significance of his own decisions in the case and the corresponding insignificance of the CIA's "remedial" policy. The most glaring red flag is the CIA's limitation of its policy to requests to destroy documents "outside the existing process for routine management of CIA materials" which Preston earlier called "the routine management of Agency materials under the terms of the Federal Records Act and its implementing Records Control Schedules." The problem is that, when properly applied, that "existing process" already covers all CIA records, none of which may be destroyed unless they are covered by records schedules approved by the Archivist of the United States. The existing process already encompasses even those temporary records that must be kept beyond their normal retention period due to FOIA or litigation. Since 1985, for example, the CIA has had an agency-wide schedule, NC1-263-85-1, that broadly covers the preservation of records relevant to "actual or impending litigation," which, according to a 1985 memorandum, was supposed to act as a general litigation hold. Unless the CIA's "summary" of its policy is misleading, it appears limited solely to requests to destroy documents that the CIA denies are records (such as it did with the tapes) under the federal records laws (called "nonrecords"), which are "outside the existing process." If this is accurate, the submission of this policy in the ACLU FOIA case could have, and perhaps should have, been viewed as a backhanded slap to the court, given that Judge Hellerstein's determination that the tapes were "agency records" under FOIA undermines (arguably completely) the CIA's interpretation that the tapes were not records under the federal records laws. Even under the most generous reading - that the policy is designed to provide legal reviews for the destruction of documents the CIA treats (even improperly) as nonrecords - this still does not remedy the real problem in the ACLU FOIA case. As Rodriguez's book shows, the issue was not insufficient levels of legal review. The problem is the CIA's legal conclusions that the tapes were not records and were subject to neither the ACLU's FOIA requests nor Hellerstein's orders, positions that the CIA has never abandoned. Put another way, the CIA's reaction to Hellerstein is essentially equivalent to the fictional CIA after action report depicted here (Warning: graphic language). A truly remedial, and much too simple, act would have been for current GC Preston to declare to the CIA that Hellerstein's interpretation of his own court order and the law, was correct, which he did not, and would not do, especially since Hellerstein was happy with so much less. When the CIA's interpretations are used as a gloss, however, Preston's recent speech at Harvard called "CIA and the Rule of Law" (thanks Lawfare) - in which he proclaims: "Just as ours is a nation of laws, the CIA is an institution of laws and the rule of law is integral to Agency operations" - rings a bit hollow. A final piece of the puzzle, however, remains. Shortly after the DOJ announced that there would be no criminal charges, the National Archives sent this letter resuming its own inquiry (initially announced in a Dec. 2007 letter) into the very question of whether the tapes, despite the CIA's public assertions, were federal records that were improperly destroyed. Even before the tapes, the National Archives repeatedly (as in again and again) questioned the CIA's abuse of the category of "nonrecords" to avoid preservation obligations. The CIA initially indicated that it had no intention of responding anytime soon to the National Archives. I have an outstanding FOIA request that will confirm whether any answer has been received. Depending upon the response, a new lawsuit, this time pursuant to the Federal Records Act, may yet be forthcoming . . .